Did you know that there are over 5,000 families with Children in San Francisco? Did you know that there are only 3,000 registered, working, homeless families with children in San Francisco? Did you know that $10,000 could provide full daycare for 70 at risk and impoverish children, ages 0-5, with daycare, hearing, dental, vision and proper education at Compass Children's Center? Did you know that $2,500 could provide one month worth of hot nutritious and organic lunches for 42 preschoolers at Compass Children's Center located in the heart of the Tenderloin. We have two Goals to reach by Christmas. 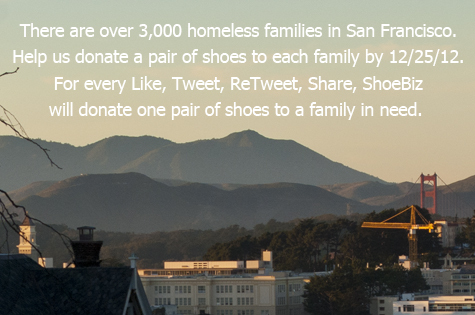 1.The first goal is provide 3,000 homeless, working families with children with shoes. 2.The second goal is to raise another $10,000 for Compass Children's Center by the end of the year. This is our invitation for you to exercise your passion and love for humanity. Are you willing to help? @converse & @shoebiz partnered to bring you these (image). Ask for these from @santa to help provide a child in need.